There’s a chance that you might have never used a bench grinder before. Maybe some of you don’t even know what it is! But for those who are working in a construction-related field, or are affiliated with it in some way, this tool can come quite handy! So let’s find out what it is. Let’s take a look at the basics of bench grinders. Bench grinders, cutting tools and chisels are normally made from tempered steel. This steel part can get hot and turn blackish due to overheating. To solve the problem of overheating, you can dip the heated part in water. Also make sure to operate the tool in frequent breaks. Use locking pliers to hold small objects. This technique is useful for protecting against burns by keeping your fingers at a safe distance from the rotating part of the tool. It also allows you to control the grinding wheel in a better way. Many grinders can run at almost 3400 rpm, unless they have a variable speed feature. If you follow all the safety precautions while working, these bench grinders won’t cause any trouble. However, experts recommend using a low rpm (about 1700) for sharpening an item. 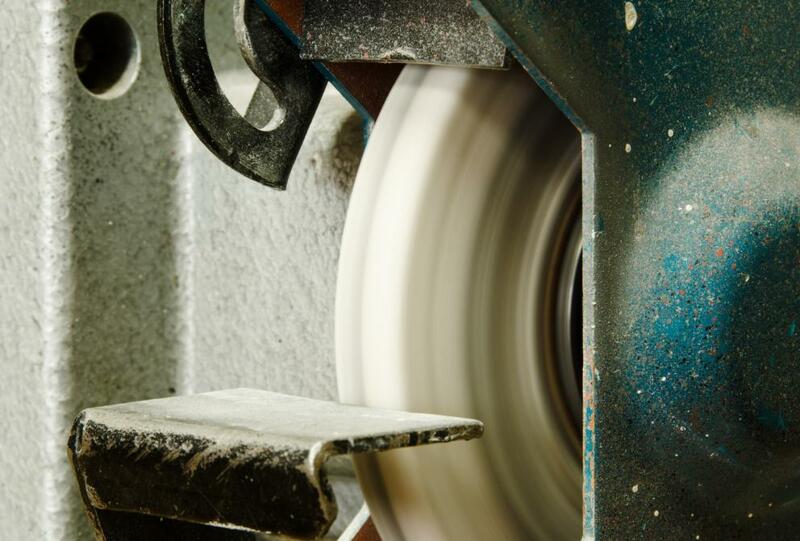 By using a grinder at a lower speed, you can reduce the risk of overheating the tool’s edge. An added benefit of working with a lower speed grinder is that it has friable grinder wheels. High-speed grinders have gray grinder wheels which are less effective in sharpening than low-speed grinders. Dressing a wheel not only improves its face, but also reveals new grit for better cutting efficiency. With the frequent use of a wheel, the cutting grit gets dull and the space in between the grit can clog. When a wheel is in a poor condition, it can slow down the material removing process; in turn increasing the chances of overheating. You should consider the safety precautions as well as keep a check on your health by wearing a good-quality dust mask on your face while working with a bench grinder. The dust containing aluminum oxide is not healthy for your lungs. It is even more harmful for frequent users of bench grinders. You can rent out a bench grinder from someone near you by using the service of Garage101. It is less likely to find a bench grinder in your area, as it is not a common tool. Normally, professionals use a bench grinder. To locate these “pros”, you can take help from Garage101. To search for a person having a bench grinder, open the map of Garage101. Take a look at the price mentioned beside the tool and if it is reasonable, get the tool. Contacting Garage101 is a simple process. You can call at +1-650-230-8081 or email at info@garage101.com if you have any query or are just looking for further information. Garage101 is a marketplace for renting tools within your community. If you have tools – list them. If you need tools – find them on the map. We find people who have unused tools and match them with people looking for tools to do their job. We show you tools that are available near you and their prices. Tell us how do you rate our website experience? Click here to rate.